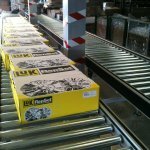 Chain conveyors are a diverse alternative to the ever popular roller conveyor systems. Their inherent simplicity makes them an ideal choice for many applications, especially when looking to transport irregular loads such as cages and stillages. 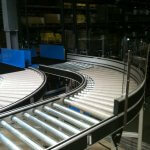 Chain conveyors can be designed in various widths, lengths and speeds to suit the needs of the client. Chain conveyors are also fairly uncomplicated so when there is a need to perform maintenance on them, it can be carried out by site engineers employed by the client. Having said that, Andrews Automation Ltd is able to provide Service Level Agreements for client peace of mind if required. Depending on the duty of the application, Andrews Automation Ltd is able to provide solutions utilising single or simplex chains, duplex chains, or in particularly heavy duty applications we can design our chain conveyors around a triplex chain design. Chain conveyors are typically designed around a 3 strand system which incorporates a strand to support and drive each of the left and right sides of the load, with a third central strand to support the centre of the load. Chain conveyors are also used on what we call ‘chain transfer’ systems. This is where one conveyor needs to be linked with a second conveyor. 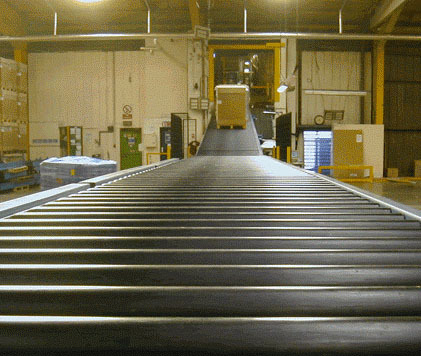 ‘Pop-up’ chain transfer systems transport loads at 90˚ with a view to transporting the load onto a second conveyor in order to continue it’s journey. ‘Pop-up’ chain transfer systems are an excellent alternative to the popular turntable as load transfer times are usually quicker with a chain transfer. The downside of a chain transfer system is the potential to change the leading edge of the load depending on the number of directional changes there are in the process.